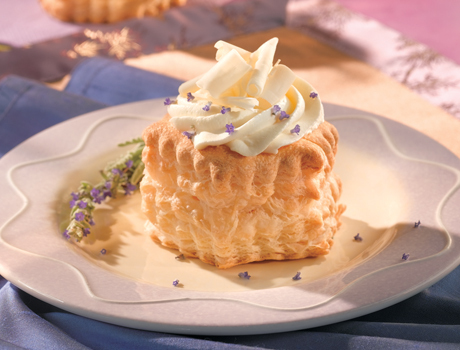 Looking for a special dessert to showcase your elegant style? 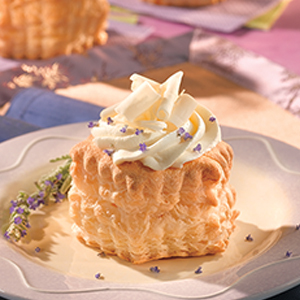 Try these festive, bakery-style pastries that use puff pastry shells for great taste, presentation and convenience. Brush the rims of the frozen pastry shells with the egg white and sprinkle with 2 tablespoons raw sugar. Prepare the pastry shells according to the package directions. Pour the water into a small cup. Sprinkle the gelatin over the water and let stand for 5 minutes. Lay a 4-inch square of cheesecloth flat on the counter. Place the orange zest pieces, star anise, cloves and cinnamon stick in the center of the cloth. Bring the corners of the cloth together and tie with kitchen string into a bundle. Place the spice bundle into a 1-quart saucepan. Stir in the wine and 1 cup granulated sugar and heat over medium-high heat to a boil. Reduce the heat to low. Cook for 5 minutes, stirring occasionally. Add the cranberries and cook until the cranberries burst. Remove and discard the spice bundle. Stir in the gelatin mixture. Let the cranberry mixture cool to room temperature. Heat the oven to 300°F. Place the pistachios into a small bowl. Add the corn syrup and stir to coat. Add the remaining raw sugar and toss to coat. Spread the pistachio mixture in a single layer on a parchment-lined baking sheet. Bake for 10 minutes or until the pistachios are golden brown. Cut a 1-inch piece from the vanilla bean. Cut in half and scrape out the seeds. Save the remaining vanilla bean for another use. Beat the mascarpone, heavy cream, 1 tablespoon granulated sugar, vanilla extract, grated orange zest, liqueur and vanilla seeds in a large bowl with an electric mixer on low speed until combined. Increase the speed to high and beat until stiff peaks form. Pipe or spoon the mascarpone mixture into the pastry shells. Top with the cranberry compote and sprinkle with the pistachios. Make-Ahead: The cranberry compote can be prepared up to one week in advance. The mascarpone mixture can be prepared up to 4 hours in advance and stored in the refrigerator.